D-Note Digital Note Pad | OhGizmo! By Andrew Liszewski on 12/28/06 • Leave a comment! 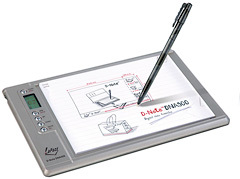 While I’ve only ever known one person who regularly used a digital notepad like this I’m going to assume there are actually a lot of users out there since they’re still being produced. The D-Note (clever, score one for the marketing guys) from LaPazz is a lightweight digital recorder that can capture text or diagrams but doesn’t need any special type of paper to do so. It does however require the use of its own pens but they come in red, blue and black colors which are individually recognized by the device and the ink can be replaced with a standard refill which is nice. The D-Note can also function like a tablet when connected to a PC though I have no idea what the precision is like. (Probably well below what a Wacom is capable of.) Unfortunately though the D-Note only comes with 32Mb of onboard storage which is not expandable and only seems to support USB 1.1. The D-Note can be found online now for about $185.